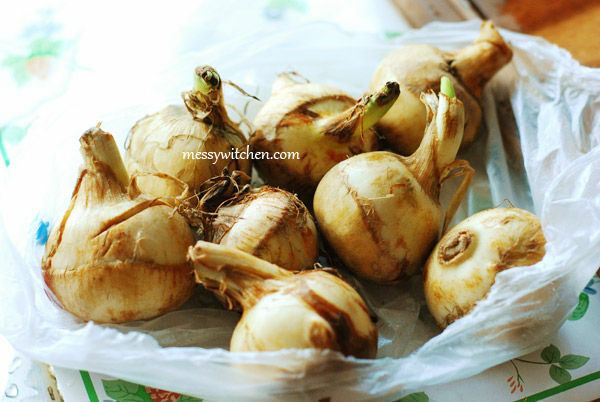 Since Chinese New Year is few weeks away, arrowhead or ngaku is abundantly found in supermarkets and markets in Malaysia. My dad cooked an arrowhead side dish for Chinese New Year last year. I found that I quite like the texture and taste. So this year I created an arrowhead Chinese New Year recipe paired with mushrooms and fatt choy. Hope you like it. 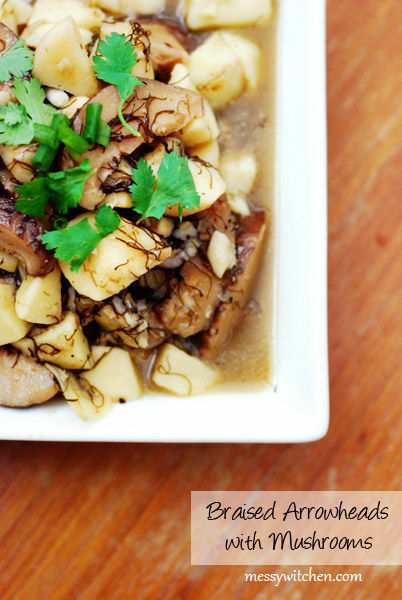 Braised arrowheads with mushrooms. Yum! Arrowheads or ngaku. I bought these at RM2.67 for about 550g (8 pieces). First, slice off the head and bottom. Then peel the skin using a peeler. Quartered the arrowheads. If you don’t like this shape, you can slice it. 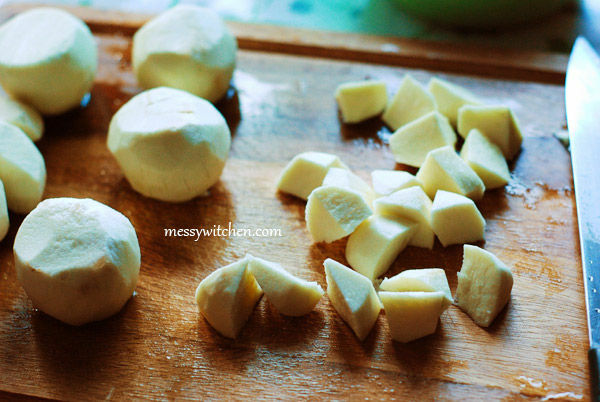 Then, slice ginger and chop garlic. 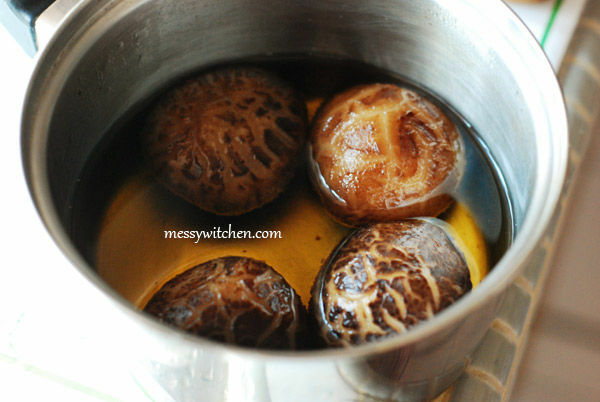 Chinese mushrooms which has been boiled. If you have time, you can soaked them for at least 24 hours. 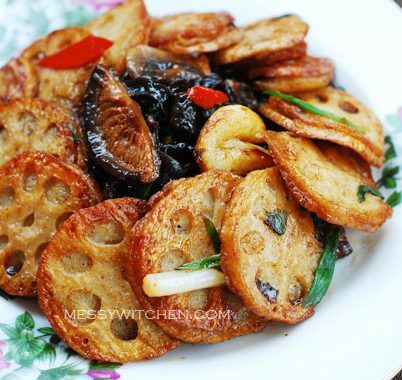 Slice the mushrooms into bite sizes. 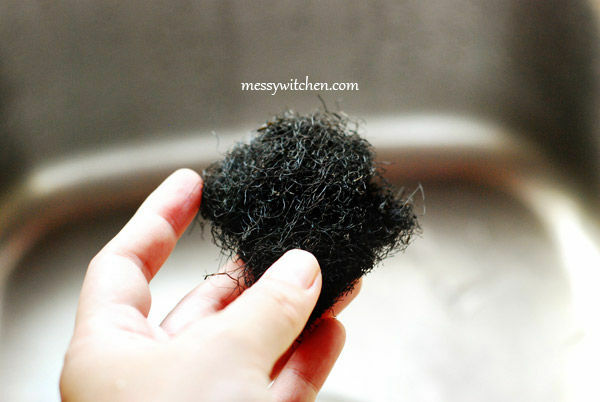 Fatt choy or black moss. Saute the garlic until fragrant then add in the arrowheads and stir-fry for about 5 minutes. 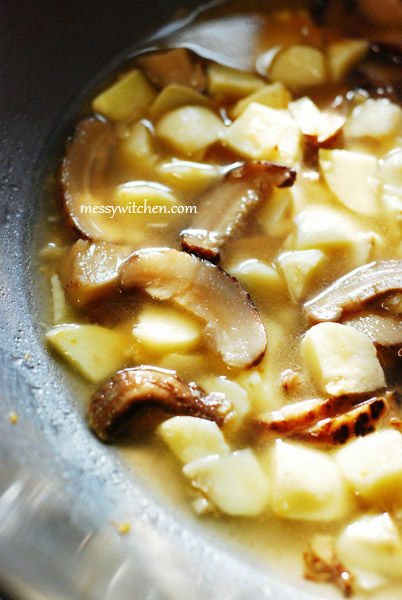 Next add ginger and mushrooms and fry for about 1-2 minutes. Then add oyster sauce. Now add enough water to cover the ingredients. Let it boil and then cover and simmer for about 15-20 minutes until arrowheads are tender. Then add fatt choy and cook for another 2 minutes. Add light soy sauce, salt and pepper. Feel free to adjust the seasoning. You can add dark soy sauce to make the dish darker (if you prefer). Mix well and then plate and garnish with spring onions or cilantro (Chinese parsley). 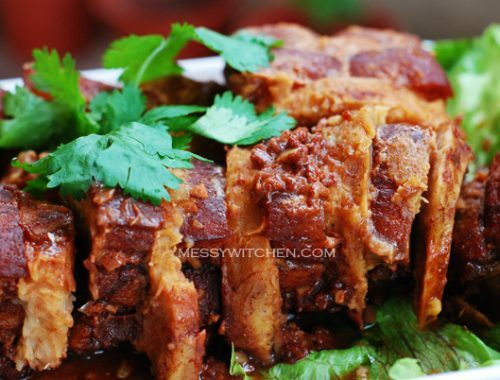 A simple dish for Chinese New Year. Try it ya! 1. 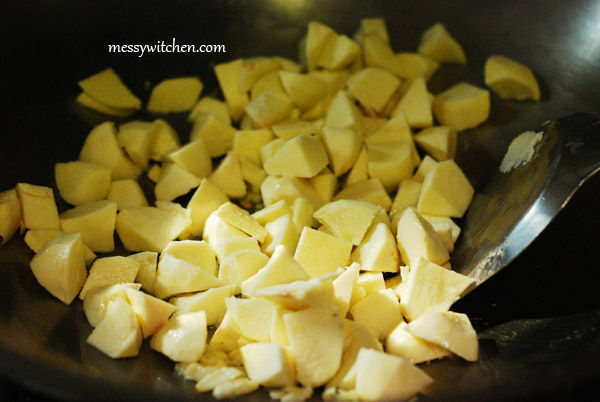 Saute garlic until fragrant with oil. 2. Add arrowheads and stir-fry for about 5 minutes. 3. 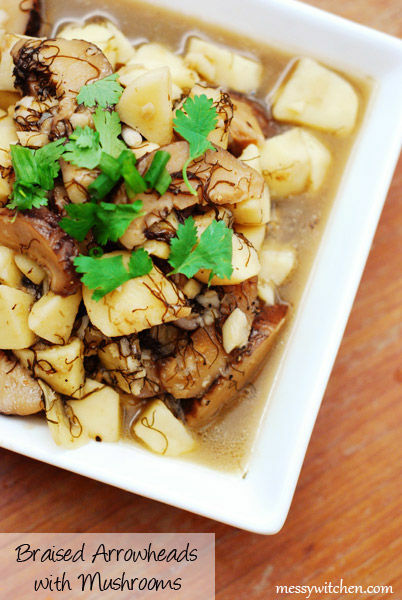 Add ginger and mushrooms. 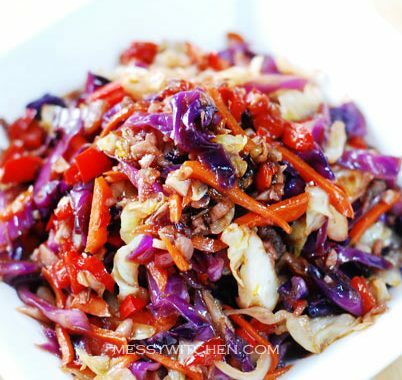 Stir-fry for about 1-2 minutes. Then add oyster sauce. 3. Then add enough water to cover all ingredients. Let it boil and then reduce heat, cover and simmer for about 15-20 minutes until arrowheads are tender. 4. Add fatt choy and cook for 2 more minutes. 5. Add light soy sauce, salt and pepper. Feel free to adjust the seasoning to your liking. 6. Plate and garnish with spring onions.